Knees are possibly the most important joints for mobility. They’re also the most prone to atrophy and injury, especially if you live a sedentary lifestyle. In the hope of finding relief, most American reach for painkillers to help them go about their daily life, but knee pain treatment comes in more simple -and much safer- forms. Yoga, for example, is great for stimulating and stretching the muscles and ligaments that support your knees. When knee pain is caused by under-use, inflammation or arthritis, exercise is an effective knee pain treatment. “Exercise is one of the best things you can do to help your knees by helping maintain range of motion and strengthening the muscles that support them. Research shows that even relatively minor increases in the strength of the quadriceps – the muscles that run along the front of the thigh – can help reduce the risk of knee osteoarthritis and its progression, and reduce pain,” writes the Arthritis Foundation (1). 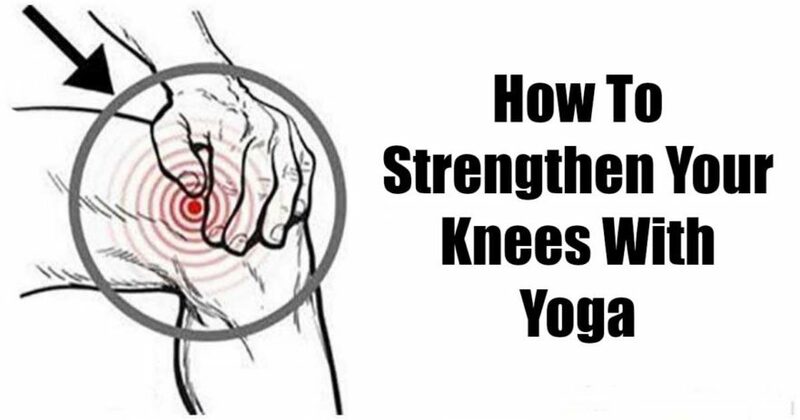 Before calling your physiotherapist, there are many yoga poses you can do at home every day to ease those knees! 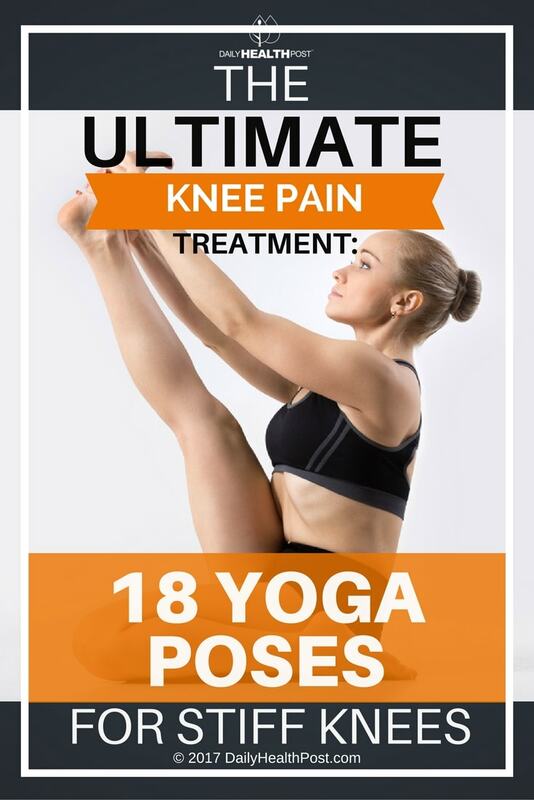 This knee pain treatment will stretch tight muscles and strengthen your joints and ligaments. You’ll feel more flexible, stronger, and pain-free. This yoga pose strengthens the muscles in the back of your knees and thighs. 1. Stand tall with your spine straight and strong. 2. Bend forward at the hip and bend your knees. 3. Bring your hands to the ground on either side of your feet and straighten your knees slowly. If you can, place your palms on the back of your calves and draw your head towards your legs. Keep your back straight and keep your ankles, knees, and hips in line. 4. Hold for 3-5 breaths. 5. Bend your knees slightly to release and repeat twice more. This pose is very similar to the butterfly stretch and gives you a great knee stretch. Start by sitting on your mat with the soles of your feet touching in front of you. Try to bring your feet towards your pelvis. Hook your toes with your index fingers and bend forward, keeping your sit bones firmly on the ground. With every exhale, bend a bit further. Hold for a few breaths and release. This classic pose is great for back pain, but it also works your inner thighs and the muscles around your knees. Start on your back with your feet on the ground beneath your knees. Keep your feet at hip’s width apart. Place your arms alongside your body, palms down. Lift your hips, squeezing your glutes and inner thighs as you do so. You back should be in a straight line. If you like, slide your shoulders under your body and lock your fingers. This pose realigns the muscles in your knees and strengthens them in their proper alignment. Stand tall and step your right foot forward to keep both teeth about 4 feet apart. Make sure your left toes face the left. Your heels should be in a straight line. Bend your left knee. Raise your left arm up towards the ceiling and out to the front on your mat. As you do so, make sure your right thigh sticks out to the left side. Your left knee should hover above your left ankle. Bring your right arm inside your right calf and hold your ankle, keeping your arm straight. Stay for 30 seconds to 1 minute. Inhale to come into your initial position. Repeat on the next time.